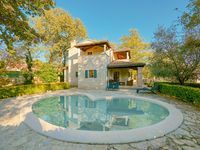 Properties in Gedići average 4.6 out of 5 stars. Property 4: Gorgeous courtyard property with pool. Restaurants & shops 2 mins walk! Modern Villa, Swimming Pool, Tennis Court, Shops, Restaurants & Bars, Near Sea. Property 43: Modern Villa, Swimming Pool, Tennis Court, Shops, Restaurants & Bars, Near Sea. Villa Capo exceeded our expectations. I loved that it was spacious. My husband and I were traveling with our 16 year old daughter and it was nice to get out of the city, retreat to the air-conditioned villa and have space to watch tv, take a nap, cook, read, swim etc... The vila size was very spacious, clean taste fully decorated for our family! Would definitely recommend this location to others and would return if given the chance to visit Istria again. Ein wundervolles Haus, mit allen was das Herz begehrt! Sch&ouml;n ruhig gelegen mit toller Aussicht in die Natur. Die Realit&auml;t &uuml;bertrifft sogar noch die Fotos. Alles sehr gepflegt und sauber. Wir hatten einen tollen Urlaub mit vier Freundinnen. Ganz kleines Manko: teilweise schlechtes WLAN. Hat aber keine Auswirkung auf 5 Sterne f&uuml;r die Villa Ida! !